This Specification Task inserts an image into a Word document to replace an existing shape that has a specific title. Source File Name File Name of the document to edit (Should be rooted or relative to the Specification Directory). The Source File Name is the name of the document once it has been created by a Specification. Titles of Images Pipebar (|) delimited list of titles of images to be replaced. This is the Title given to the inserted shape (see Set Up below). Naming a shape using Alt Text is supported for Excel and Word builds 1803 and earlier. 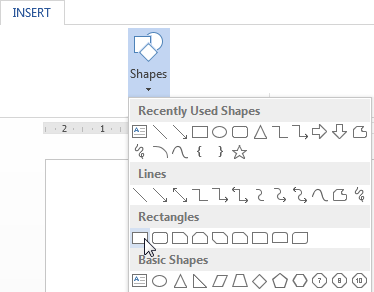 Naming a shape using Alt Text and Selection is supported for Excel and Word builds 1804 and newer. New Images File Names Pipebar (|) delimited list of images to insert, in the order they are required to be inserted relative to titles (Must include Full File Paths, or paths relative to the parent file). Show Word Word Application will be visible if set to TRUE. Extension for Saving File Pipebar (|) delimited list of extensions to save the file as (e.g. .pdf|.xps|.txt). The Replace Image task works by replacing a Shape in the Excel document. Click the INSERT menu, select Shapes and select a rectangular shape to insert. Draw the shape at the point the image is required to be. The original Line, Effects and Text Box properties of the shape will be maintained. Only the FILL property will be changed to Picture Fill when the image is replaced. Shapes with rounded edges, thick borders etc. will be preserved when the image is inserted. Images will be cropped and scaled to suit the size and layout of the original shape. Right Click the shape and select Format Shape from the menu. From the Format Shape window (usually located on the right hand side of the Microsoft Excel window) select the Layout & Properties icon. 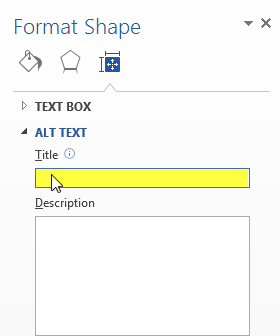 Expand the ALT TEXT item and enter a name for the shape in the Title field. This is the name that is to be entered into the Titles property of the task. Right Click the shape and select Edit Alt Text from the menu. From the Alt Text window (usually located on the right hand side of the Microsoft Excel window) enter a name for the shape in the Title field. Select the shape and, from the Editing group in the Home tab, click Select and select Selection Pane from the menu. From the Selection window (usually located on the right hand side of the Microsoft Excel window) enter a name for the shape in the Name field. Source File Name DWSpecificationFullPath&"\QuoteMasterDoc.docx" C:\MyDocuments\Project\QuoteMasterDoc.docx This is the Full File Path location of the Word document to replace images for. Titles Of Images "LogoLocation" LogoLocation This is a pipebar (|) delimited list of Titles of images to be replaced. These are the Titles of the shapes that you have set Titles for using Alt Text. New Images File Names "C:\MyDocuments\MyPictures\Logo.JPG" C:\MyDocuments\MyPictures\Logo.JPG This is a pipebar (|) delimited list of images to insert, in the order they are required to be inserted relative to the Titles of the images order. Show Word TRUE TRUE TRUE will make the Word application visible. FALSE will not. Extension For Saving File ".docx" .docx This will save the Word document as a docx file.